In the pursuit of achieving cost-efficiency and the highest quality level for our customers, Mitsubishi Chemical Advanced Materials integrates a high level of automation into our injection molding activities. This enables us to be competitive in terms of manpower but mostly the automation in assembly, quality assurance and packaging is eliminating human errors and secures consistency leading to “zero defects”. 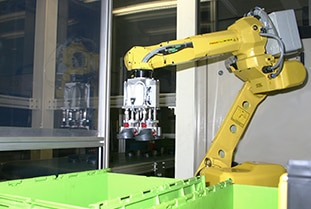 Automation is applied in the upstream processes, such as resin material handling, to post-molding operations such as packaging and transporting the final goods.